Our promise to Owners: we’ll keep you connected through online and in-person networking and educational opportunities throughout the year. Design-build is all about collaboration and DBIA works hard to provide Owners with a variety of ways to access the education, networking and resources they need to do the job right. 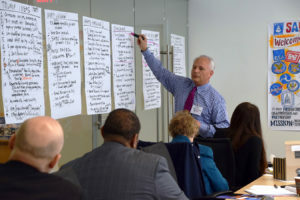 Each year, DBIA and the Society of American Military Engineers (SAME) host the Federal Owners Forum, bringing together a diverse group of agency leaders to brainstorm solutions to the unique challenges facing federal project delivery teams. DBIA and SAME strive to help federal agencies ensure they have the right tools, the right people and the right processes to succeed. We’ve released three reports with recommendations on improving federal project delivery. DBIA hosts Owners-Only Forums at all our Conferences. Owners can learn a lot from each other. That’s why DBIA hosts the largest design-build Owners-Only networking and education sessions in the nation. The conversations are lively and open, with attendees going home with new ideas and strategies to succeed. Owners-only forums at our Design-Build for Transportation and Design-Build for Water/Wastewater conferences each spring allow owners the opportunity drill-down on issues specific to each sector. In the fall, DBIA's Design-Build Conference and Expo gathers design-build owners across all sectors, locations and project types to network and share their project experiences. “I not only brought back valuable information to implement on my design-build projects, but also lessons I can apply to other projects and other facets of my organization." The Owners-Only group allows DBIA Member-Owners to ask questions and engage with other design-build Owners throughout the nation.